Wow. What a day we had yesterday! I don't even know how to come up with the right term to describe it. We thought the scenic flight we did in Yukon's Tombstone Park was spectacular (and it was!) but this may have been even better! The largest non-polar icefield in the world is located in Yukon's Kluane National Park. The ice and snow stretches for further than you can see, and in places, the ice is over 700 meters thick. To see it all up close is a very surreal experience! 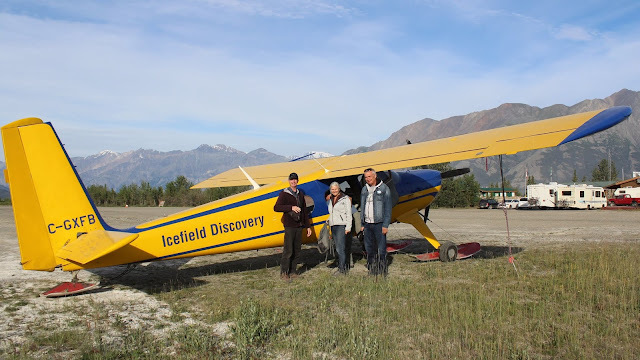 We were to set off with Icefield Discovery from the tiny Silver City airport at the southern end of Kluane Lake. Our friends Dan and Isabelle were coming with us to see if there was enough space on the plane for them as well. After all, this was a once in a lifetime opportunity! Great news, Dan and Isabelle were able to go on the flight with us! 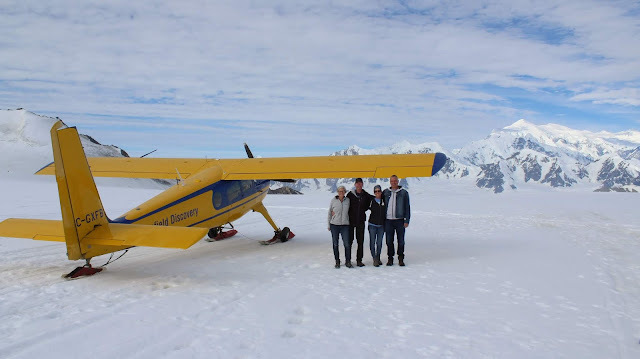 We would be flying 124 kms (77 miles) over the nearby mountain range, and through the glacier valleys to arrive at the start of the Hubbard glacier and the base of Mount Logan, at 5,959 meters (19,551 ft) Canada's highest mountain. 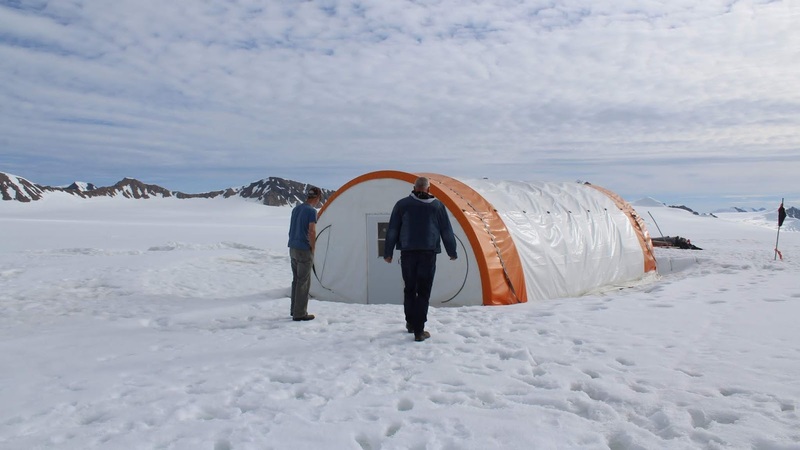 Then, we would actually land on the glacier and get out and walk around! We were all weighed so that the little plane would have even weight distribution. We met our pilot Mike, and he went over a few things with us and then sat us in our various seating locations. The plane is equipped with both wheels and skis! Ready to get on the plane. Ruth gets the back seat with big windows on each side. Isabelle and Dan are looking pretty excited... and for good reason! We had to steadily gain some altitude. The airstrip at the southern tip of Kluane Lake is at about 2,500 ft, and our landing spot on the glacier is at about 8,500 feet. Then, only 25 kms (15 miles) from our landing spot, Mount Logan is at 19,551 ft! These mountains look big. And they are... until we get to the really big ones! Our first view of the glaciers. Our first view of Mount Logan. We were actually still quite far away. The glaciers make interesting patterns when they meet. Our pilot Mike was telling us that the photo above was a really pretty lake about two weeks ago. Then, overnight the water disappeared as it found a way to drain under the glacier. Left behind are chucks of ice the size of houses. This happens every year, and only takes between 24-48 hours to disappear. It's really difficult to get a sense of perspective up in the plane. Wow. It is always wintertime here! The Hubbard Glacier starts here and makes it's way 122 kms (76 miles) west where it drops into the Gulf of Alaska. The Hubbard Glacier is going against climate change predictions and is actually growing, even though the entire icefield area in Kluane Park has lost about 20% of its area in the last 50 years. Landing on the icefield is a challenge because it's difficult to discern between the sky and the snow. But Mike made it look easy and soon we were bumping our way down the glacier as we slid to a stop on the landing skis. We were lucky... there was no wind at all! It felt like a different world! We spent about a half an hour on the ground taking photos. What a fantastic experience. 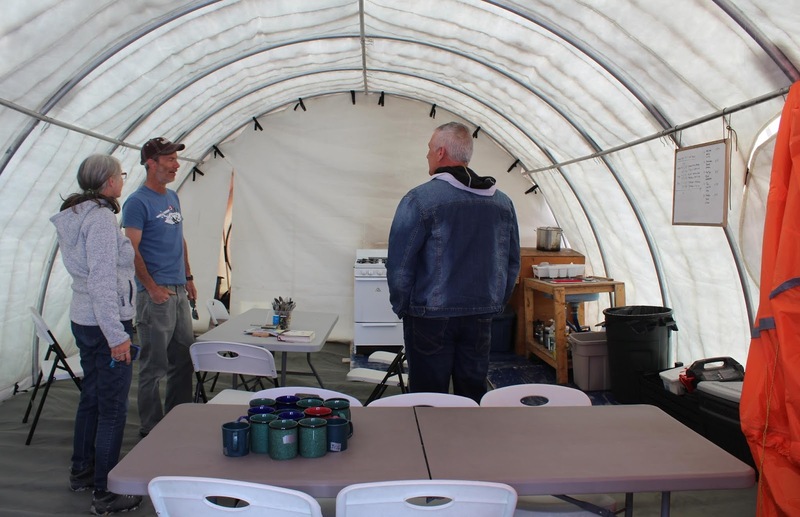 They have a camp set up out here on the ice, and you can actually book a trip with them where you spend three days at the camp! They also fly climbers in who are going to attempt the highest point in Canada. From this point, it is a three week trip to the top and back! The peak of Mount Logan is about 25 kms (15 miles) away. Of course we have to have some fun while we're up there! Ruth, Kevin, Isabelle, and Daniel. I wandered far away just to experience the silence and solitude. It was an amazing feeling. It's not only about Mount Logan. The area is surrounded by peaks of slightly lesser height. And then it was time to head back. We took a slightly different route following the path of the glaciers as they meet up with one another and make their way to the valleys below. The wreck of a small plane that crashed while trying to take off on the glacier many years ago. Mike says the pilot, who was on his own, survived. Looks man made, but it's not. It's called a medial moraine. It's what happens when two glaciers meet, and they push the sediment together. What a fantastic adventure. It's one of those things that words just can't describe. Many thanks to Yukon Tourism for supporting us and sponsoring this adventure so that we can show you how beautiful and rugged the Yukon is. Wow! What a flight. I'm so glad the glaciers are surviving global warming. It was a fantastic flight. Certainly a once in a lifetime experience. Absolutely awesome! Your great pictures and writing really make it seem like we're there with you. Great photos ! As a pilot myself...I have always wanted to fly Alaska and the Yukon,alas,age and life has caught up with me. Thank you Richard! You may not be able to fly yourself up to the glacier but you can still get up there to enjoy it. I know it wouldn't be quite the same but it would still be a fantastic experience. Nice that you and Jim were able to have a similar experience! Mount Denali would also have been a sight to see. Absolutely amazing! The patterns in the glaciers are really cool. Great pictures. Thank you Peter! Everything about the glaciers were pretty cool to see. It was amazing to see it all from above but it sure doesn't give you perspective as to how enormous they are. Just amazing!!! Thanks so much for sharing! Definitely makes me want to go there! Very cool indeed! It is amazing what these glaciers have done over the last many, many 1000's of years and what they are still doing today. WOW, WOW, WOW! Best pictures of the glaciers up close and personal! Before reading Kevin’s explanation, I thought the medial moraine was a berm! Lol! Learned something new again! What a surreal experience! Thank you so much for the “flight ride”! A medial moraine is sort of like a natural made berm! Awesome pictures! What a fantastic experience and how wonderful that you shared it with all of us. You guys had a fantastic view of the glaciers from your flight. So glad you could expierence it with RV friends. Pictures are amazing we felt like we were there with you all. Awesome trip. It was fantastic to see these glaciers up so close and to see how they have moved both forward and backwards over time and how they have changed the landscape. It truly is amazing. Well, this is the icing on the cake - incredible pictures - thank you!!!! Yeah, I think it is going to be pretty hard to beat this experience! Oh my, such gorgeous photos and such a surreal experience you had! And what a change from the 80+F temps just a day or two earlier. I can't imagine, but I am envious. The earth is an amazing place, isn't it? It was a totally amazing flight and experience. It was still nice and warm back where we left Sherman at the airport but up there the temperature was hovering around 0C (32F) and it felt wonderful and cool, very refreshing. Yes, our earth is an amazing place! Yep, it was hard to find the words to describe that whole experience but that one word was repeated many times over the course of an hour and half or so!